HAPPY 1st ANNIVERSARY LINDA READS!! Next month Linda Reads will celebrate it’s 1st anniversary. To celebrate this I WILL GIVE AWAY A BOOK… yes give away a book, to one lucky reader – anywhere! Just fill in the comment part of this entry below, giving me your name and e-mail address, and on March 9th I will pick one entry at random out of a hat. The winner must allow me to print their name and city on my blog. I will contact them to get their address for delivery. That’s it… easy peasy! I’ve had more fun than I ever imagined writing Linda Reads, and I hope to be able to continue to suggest books that might appeal to readers out there in cyberspace. Thanks so much for checking me out, and sending feedback to spur me on my literary adventure. Thanks, merci beaucoup, muchas gracias, obrigado, salamat. Scandinavian mystery writers are hugely popular at the moment. Stieg Larsson, Henning Mankell, Karin Fossum, and Arnaldur Indridason to name just a few. I decided it was time to take a closer look at this group of writers. Stieg Larsson’s first book, The Girl With the Dragon Tattoo, has sold 20 million copies worldwide. His second book, The Girl Who Played With Fire, is at the top of the charts at the moment. He wrote 3 books in total but died just after submitting them to the publisher. Unfortunately he never got to enjoy his success. Off the top here I’m going to tell you that I am not a fan of short stories… why am I telling you this now? … because the book I chose to read, The Pyramid: The First Wallander Cases (Vintage Crime/Black Lizard) by Henning Mankell is a book of short story mysteries that are part of his famous Kurt Wallander series. These stories focus on the early life and career of his famous detective and are a perfect introduction to the succeeding 8 books in the Wallander series. I figured it was a good way to see if I want to read a complete novel. Besides, for someone who was having great difficulty keeping her interest in ANY book at the moment (I’ve been pre-occupied with other interesting things), I could read one story and put the book down and pick it up again the following week without having to remember who did what to whom. This is a great travelling book – short stories often are – and I suggest you give it a try if you have winter holiday plans or just want to try a new author. He’s a great writer. I am so keen to read Joan Thomas’ new book Curiosity. It’s due out at the end of March. Her previous book, Reading by Lightning, was a favourite of mine (check out my blog entry a few months back). I really like author Michael Pollan. His previous books, The Omnivores Dilemma and In Defence of Food, rank right up there on my list of must reads. His new book, Food Rules: An Eater’s Manual (published by Penguin Books) is chock-a-block full of good advice that’s written in plain English and easy to digest (more than you can say about some processed foods eh). It’s a quirky little book, about the size of a small pocket book, just 140 pages in total, and there are lots of pages that just have a single paragraph on it with info like … “avoid food products that make health claims” and “if it came from a plant, eat it, if was made in a plant don’t”. Not a whole lot of words, but a whole lot to think about in relation to what we eat. Once again he doesn’t disappoint with his advice. Remember, he’s a journalist, not a nutritionist, but his recommendations are food for thought for everyone confused by all the info out there just now when trying to decide what to eat. This book is flying off the shelves out there right now in local bookstores. Pick up a copy, it’s not expensive. Freeman Patterson is one of THE most respected nature photographers. He has written 11 books, has held photography workshops all over the world, and has received numerous awards including the Lifetime Achievement Award from the Nature Photography Association. 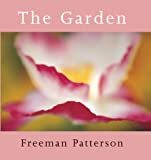 His book The Garden (published by Key Porter Books) is a joy to read and a sight to behold. Gardening and photography go together like salt & pepper and if you’re lucky enough to have the knack for both, or even just one, this is definitely a book you’ll want to read. And even study. Comments about his garden and his life … “My garden grows wilder as I grow older.” and “The importance of beauty to our lives requires no explanation, and we never need to explain our reasons or apologize for actively seeking it out.” are peppered throughout the book alongside amazingly beautiful photographs. He also says “Gardening always requires a degree of imagination.” and I imagine myself in summer out there with my camera in hand trying to capture my garden in a light reflective of his stunningly beautiful book. Freeman Patterson I’ll never be, but I hope to “improve with age” as I learn more about the joy of photographing my garden. Just look at the book cover… is this beautiful or what?! Robert Rotenberg, author of Old City Hall (that great book I wrote about last year) has sold the TV/film rights of his book to Shaftesbury Films. They want to make it into a TV series. Great news eh!